In 1702, Peter the Great commissioned the first census of Russia. Following the first census, there were ten revisions, or updates, that were made through 1857. A revision is a census or tax list created by the Russian government to identify taxpayers and to use as a basis to reallocate farmland under the mir system. The Volga Germans held their land in communal ownership within a mir community, which acted as a village government and a cooperative. Arable land was divided in sections based on soil quality and distance from the village. Each household had the right to claim one or more strips of land from each section depending on the number of adults in the household. The purpose of this allocation was not so much social (to each according to his needs) as it was practical (that each person pay his taxes). Strips were periodically re-allocated on the basis of a census revision, to ensure equitable sharing of the land. This practice was enforced by the state, which had an interest in the ability of households to pay their taxes. The census revision lists generally identify each member of the family by name, giving their ages and relationships. The lists sometimes show the birth and death date of individuals who died since the last list was made. The census were usually written in Russian and were often taken in the winter months when people were more likely to be at home. The first revision lists were made in 1719 and 1743, before the colonists arrived in the Volga settlement area. As a result, the table below begins with the 3rd census revision in 1767, which was taken shortly after the founding of Norka on August 15, 1767. The final revision to the 1702 census was undertaken in 1857. Thereafter, periodic censuses were taken by the Russian and Soviet governments up to 1931. (1) Pleve, Igor. Einwanderung in Das Wolgagebiet 1764-1767, Volume 3, Kolonien Laub-Preuss (Colony of Norka). Gottingen: Nordost-Institut, 2005. Print. (2) Pleve, Igor. Einwanderung in Das Wolgagebiet 1764-1767, Volume 3, table on page 11 and note on page 12, Kolonien Laub-Preuss (Colony of Norka). Gottingen: Nordost-Institut, 2005. Print. Pleve notes that the source of the population count for 1773 is the book "Reise durch verschiedene Provinzen des Russischen Reichs, Dritter Theil. Vom Jahr 1772 and 1773". St. Petersburg, 1776; Seiten 608-624 by P. S. Pallas. The population table showing Norka is presented on page 446 of the 1778 edition of Pallas's book that was scanned by Google Books. (3) The 1775 and 1798 Censuses of the German Colony on the Volga, Norka: Also Known as Weigand. Lincoln, Neb. : American Historical Society of Germans from Russia, 1995. Print. The 1798 census is dated November 28, 1798. (4) "Historical, Geographical and Statistical Description of the German Settlements (Russian Language)." History of the Volga German:Norka. Web. January 2015. <http://lexikon.wolgadeutsche.net/article/693>. (5) Rye, Richard, trans. The 1811 Census Revision of the German Colony on the Volga, Norka. Lincoln, Neb. : American Historical Society of Germans from Russia, 1996. Print. This census is dated August 24, 1811. The 1811 census was made to determine the land allotments of the colony. Since land was allotted solely based on the number of males in the colony, no data on females is included. However, given a consistently equal male/female distribution pattern over time, it is likely that the total population was about 2,200 souls at this time, with approximately 1,100 females. The 1811 census also contains information from the prior census revision in 1798. (6) "Historical, Geographical and Statistical Description of the German Settlements (Russian Language)." History of the Volga German:Norka. Web. January 2015. <http://lexikon.wolgadeutsche.net/article/693>. (7) Mai, Brent Alan. 1834 Census of Norka in the District of Saratov, Russia, Dated 20 December 1834. Beaverton, OR: Dynasty Pub., 2007. Print. This census is dated December 20, 1834 and also contains information from the 1816 census. (8) "Historical, Geographical and Statistical Description of the German Settlements (Russian Language)." History of the Volga German:Norka. Web. January 2015. <http://lexikon.wolgadeutsche.net/article/693>. This census is dated January 21, 1858 and includes several appendices from March 1858 to March 1859. The 1857 census also contains information from the 1850 census. (10) Beratz, Gottlieb. The German Colonies on the Lower Volga, Their Origin and Early Development: A Memorial for the 150th Anniversary of the Arrival of the First German Settlers on the Volga, 29 June 1764. Trans. Adam Giesinger. Lincoln, Neb. : American Historical Society of Germans from Russia, 1991. Pages 348 and 351. Print. (11) Pleve, Igor. Einwanderung in Das Wolgagebiet 1764-1767, Volume 3, Page 12, Kolonien Laub-Preuss (Colony of Norka). Gottingen: Nordost-Institut, 2005. Print. Pleve notes that the population numbers derived for the year 1769 are from the appendix of a book by G. G. Pisarevskii (Pisarevsky). This book was likely Pisarveksy's work entitled "Iz istorii inostrannov kolonizatsii v Rossii v XVIIIv". Moscow, 1909 (Studies on the History of Foreign Colonization in Russia in the 18th century. Moscow, 1909). See note (33). (12) Pleve, Igor. Einwanderung in Das Wolgagebiet 1764-1767, Volume 3, Page 12, Kolonien Laub-Preuss (Colony of Norka). Gottingen: Nordost-Institut, 2005. Print. The travel records of P. S. Pallas. (13) Minkh, A. N. Historical and Geographical Dictionary of the Saratov Province. Saratov, 1898. 688-691. Print. Translated by Dr. Lyudmila I. Koretnikova. According to the Saratov Province Statistics Committee (1891) there were 727 households, 5,202 males, 4,998 females, total: 10,200 people of both sexes. (14) "Historical, Geographical and Statistical Description of the German Settlements (Russian Language)." History of the Volga German:Norka. Web. January 2015. <http://lexikon.wolgadeutsche.net/article/693>. Zemstvo census of 1886. The Zemstvo was a council of elected officials established in czarist Russia to administer local affairs in provincial districts. (15) "Historical, Geographical and Statistical Description of the German Settlements (Russian Language)." History of the Volga German:Norka. Web. January 2015. <http://lexikon.wolgadeutsche.net/article/693>. 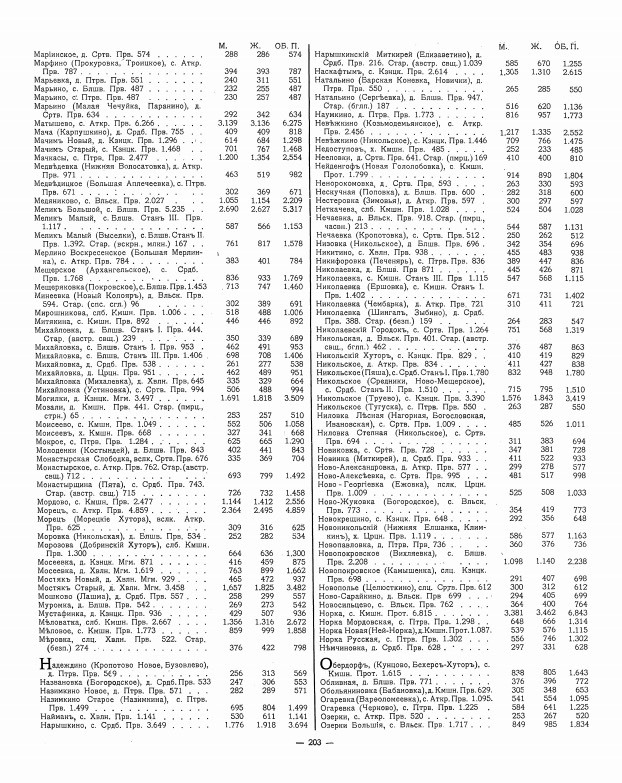 List of settlements of the Central Statistical Committee, 1862 edition, Information from 1860. (16) "Historical, Geographical and Statistical Description of the German Settlements (Russian Language)." History of the Volga German:Norka. Web. January 2015. <http://lexikon.wolgadeutsche.net/article/693>. (17) All ethnic Germans living in Norka, except women married to non-German men, were deported by order of the Soviet government to Siberia and Central Asia in September 1941. Transport lists of the deportees from Norka are believed to exist, but have not been translated. The transport lists will provide important data to determine the population size in 1941 as well as identifying the individuals that were impacted by the deportation. (18) Mai, Brent Alan. 1798 Census of the German Colonies along the Volga: Economy, Population, and Agriculture. Lincoln, Neb. : American Historical Society of Germans from Russia, 1999. Print. (19) "The Center for Volga German Studies at Concordia University." The Center for Volga German Studies at Concordia University. Web. January 2015. <http://cvgs.cu-portland.edu/>. The Russian Imperial Census of 1897 was the first and the only census carried out in the Russian Empire (Finland was excluded). It recorded demographic data as of 28 January [O.S. 15 January] 1897. If 6,843 is the total population, it appears to be inaccurate given that the total population in 1894, just 3 years earlier, was much higher. The 1905 population is also much higher than the 1897 figure. It is possible that the number listed for this census includes only males (although both males and females were counted). It is noted that 6,815 of the total are ethnic Germans. (20) "Historical, Geographical and Statistical Description of the German Settlements (Russian Language)." History of the Volga German:Norka. Web. January 2015. <http://lexikon.wolgadeutsche.net/article/693>. Household, male and female counts. (21) Dalton, Hermann. Geschichte Der Reformirten Kirche in Russland: Kirchenhistorische Studie. Trans. William Pickelhaupt. Gotha: R. Besser, 1865. Print. A detailed table from"Geschichte der Reformirten Kirche in Russland" in 1864 (pages 233-234) shows that there were 6,650 souls listed as members of the Norka Reformed Church. This figure is very close to the population documented in 1860. It is assumed that a small percentage of the population were not church members. (22) "Historical, Geographical and Statistical Description of the German Settlements (Russian Language)." History of the Volga German:Norka. Web. January 2015. <http://lexikon.wolgadeutsche.net/article/693>. (Original source unknown). The population of Norka decreased dramatically (nearly 50 percent) between 1912 and 1920. While a small portion of the decrease can be linked to continued emigration, most of the decrease must be attributed to the famine from 1920 to 1924 that was caused by Bolshevik government. (23) "Historical, Geographical and Statistical Description of the German Settlements (Russian Language)." History of the Volga German:Norka. Web. January 2015. <http://lexikon.wolgadeutsche.net/article/693>. (Original source unknown). 7,454 of the total were ethnic Germans. (24) "Historical, Geographical and Statistical Description of the German Settlements (Russian Language)." History of the Volga German:Norka. Web. January 2015. <http://lexikon.wolgadeutsche.net/article/693>. (Original source unknown). 7,693 of the total were ethnic German. (26) Stumpp, Karl. The Emigration from Germany to Russia in the Years 1763 to 1862. Lincoln, Neb. : American Historical Society of Germans from Russia, 1973. Print. (27) Stumpp, Karl. The Emigration from Germany to Russia in the Years 1763 to 1862. Lincoln, Neb. : American Historical Society of Germans from Russia, 1973. Page 73. Stumpp shows the total population as 7,210 in 1926. Stumpp's count likely includes only the ethnic Germans in the population. (28) Stumpp, Karl. The Emigration from Germany to Russia in the Years 1763 to 1862. Lincoln, Neb. : American Historical Society of Germans from Russia, 1973. Page 73. Stumpp lists the total population as 957 in the year 1772. (29) Pleve, I. R., and Richard R. Rye. The German Colonies on the Volga: The Second Half of the Eighteenth Century. Lincoln, Neb. : American Historical Society of Germans from Russia, 2001. Page 314. Print. (30) Mai, Brent Alan, and Dona B. Reeves-Marquardt. German Migration to the Russian Volga (1764-1767): Origins and Destinations. Lincoln, Neb. : American Historical Society of Germans from Russia, 2003. Page xxvii. Print. This source shows a total population of 1,660 in 1798 and 7,210 in 1926. (31) Lichkov, L. The Collection of Statistical Data on the Saratov Province. Volume 11. Kamyshinsky District. Saratov, 1886. This book was issued in Saratov in 1883-1886. The author writes: In 1886, 50 percent of the land in Norka was rented. At the same time 41 percent of the land owners leased sites. Norka was a rich village. In 1890, of the 26 villages in Kamyshin District, only 4, including Norka, paid taxes on time to the state. In the years 1886-87, from 11 colonies of the Kamyshin District, 214 families left for America. There were very high rates of growth in the population of the colonies. From 1834 to 1850 in the central areas of Russia, the average increase per 1,000 of population was 50 to 70 persons, in the Volga German region there average increase was 500 people per 1,000 of population. (32) Sallet, Richard. Russian-German Settlements in the United States. Fargo: North Dakota Institute for Regional Studies, 1974. Print. Sallet's table titled "German Settlements in the Volga Region" (page 156) shows that by 1912, there were 14,538 people in the colony declining to 7,210 in 1926. The information in the table comes in part from the Heimatbuch der Ostumsiedler Kalendar 1955, Arbeitsgeminschaft der Ostumsiedler, Stuttgart. The table also incorrectly shows the population in the settlement year of 1767 as 957, which is actually the population number that P. S. Pallas reported in 1773 (see note (2) above). (33) Orlov, Grigory Grigoryevich, Report of Conditions of Settlements on the Volga to Catherine II, February 14, 1769. Translation courtesy of Bill Pickelhaupt. Report No. 38 appears to have been included in the studies of G. G. Pisarevskii, February 1769. See note (11). (34) Pleve, I. R., and Richard R. Rye. The German Colonies on the Volga: The Second Half of the Eighteenth Century. Lincoln, Neb. : American Historical Society of Germans from Russia, 2001. 219-242. Print. Page 88, states that a family was defined as a husband and wife with male children younger than 20 years old and females younger than 18 years old. Single males 20 years of age or older were listed as a second family, and females 18 or older were also listed as a separate family. (35) Troĭnit︠s︡kiĭ, N. A., eds. Naselennyi︠a︡ Mi︠e︡sta Rossiĭskoĭ Imperii V 500 I Boli︠e︡e Zhiteleĭ: S Ukazaniem Vsego Nalichnago V Nikh Naselenii︠a︡ I Chisla Zhiteleĭ Preobladi︠u︡shchikh Vi︠e︡rospovi︠e︡daniĭ, Po Dannym Pervoĭ Vseobshcheĭ Perepisi Naselenii︠a︡ 1897 G.. S.-Peterburg : Obshchestvennai︠a︡ Polʹza. Page 203. 1905. Available online through the University of Illinois Library. <http://brittlebooks.library.illinois.edu/brittlebooks_open/Books2009-08/russia0001nassta/>. Feldblyum, B. "Russian Revision Lists: A History." AVOTAYNU, Volume XIV, Number 3, Fall 1998. <http://www.bfcollection.net/fast/articles/ruscensus.pdf>.